Collecting paper money is a fascinating and often profitable hobby. Paper notes offer a glimpse into American and world history, often using colorful and intricate artwork to depict memorable events and people of historical significance. Serious collectors began taking an interest in this hobby around the mid-20th century, and it has been gaining in popularity ever since. What Makes a Note Valuable? Condition, scarcity, and demand are the three factors that help determine the value of anything collectible, and that includes paper money. Age is a consideration; however, an older bill may be worth less than a newer one depending upon how many of each were originally printed in the series. Unlike a Picasso or a Rembrandt, where there exists only one of a particular masterpiece, paper money is printed in series lots of identical bills, usually varying only in serial number. Therefore, the value and collectability of a particular note has a great deal to do with its condition. An uncirculated bill in mint condition can sell for many times more than a circulated bill of the same denomination and series. Demand by fellow collectors is also a major factor to consider. 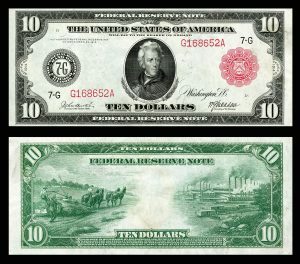 Large-sized notes, silver certificates, and large denominations that are no longer used in general circulation often garner a higher price than other notes. Collecting paper money is a fascinating hobby and high-quality bills make a good addition to any investment portfolio. Furthermore, when you seek out and set aside new bills as they are issued, you are assured that your investment will be worth at least what you paid for it—even in the short term. Consequently, if an unexpected expense arises, liquidation of a paper money collection is seldom difficult. For more information about collecting paper money, or to get an estimate on anything in your existing collection, reach out to the experts at Chicago Gold Gallery.